The exterior of the historic Les Arenes in Arles, France is surrounded by street vendors with their own individual market stalls. 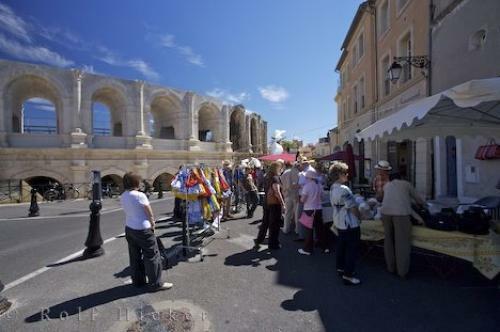 Photo of the street market outside the Les Arenes in Arles, France in Europe. ... Outside Les Arenes surounded by Market Stalls in the city of Arles, Bouches du Rhone, Provence, France, Europe.